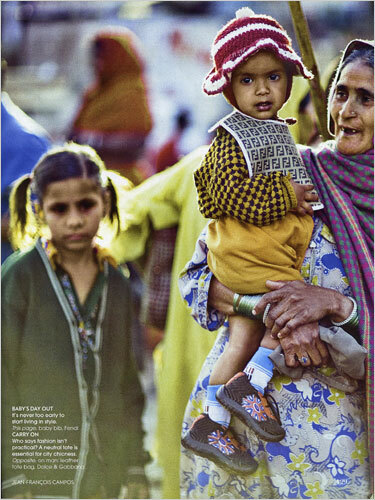 In Vogue India magazine, a child from a poor family modeled a Fendi bib, which costs about $100. A man modeled a Burberry umbrella in Vogue that costs about $200. Some 456 million Indians live on less than $1.25 a day. A family of three squeezes onto a motorbike for their daily commute, the mother riding without a helmet and sidesaddle in the traditional Indian way — except that she has a Hermès Birkin bag (usually more than $10,000, if you can find one) prominently displayed on her wrist. Welcome to the new India – at least as Vogue sees it. Vogue India’s August issue presented a 16-page vision of supple handbags, bejeweled clutches and status-symbol umbrellas, modeled not by runway stars or the wealthiest fraction of Indian society who can actually afford these accessories, but by average Indian people. Perhaps not surprisingly, not everyone in India was amused. There’s nothing “fun or funny” about putting a poor person in a mud hut in clothing designed by Alexander McQueen, she said in a telephone interview. “There are farmer suicides here, for God’s sake” she said, referring to thousands of Indian farmers who have killed themselves in the last decade because of debt.